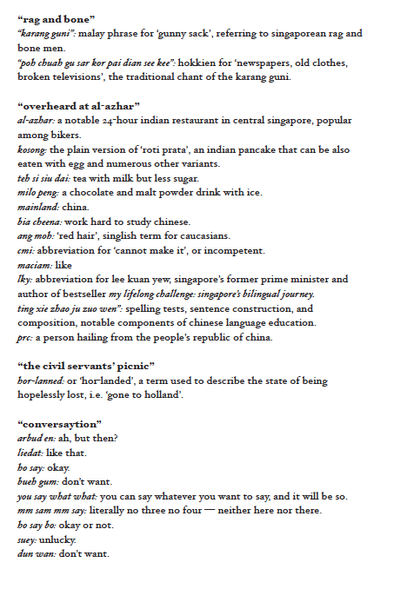 sonnets from the singlish is a collection of 44 poems on love, language and other funny stuff, loosely translated from the english- based creole language colloquially spoken in singapore, widely known as singlish. 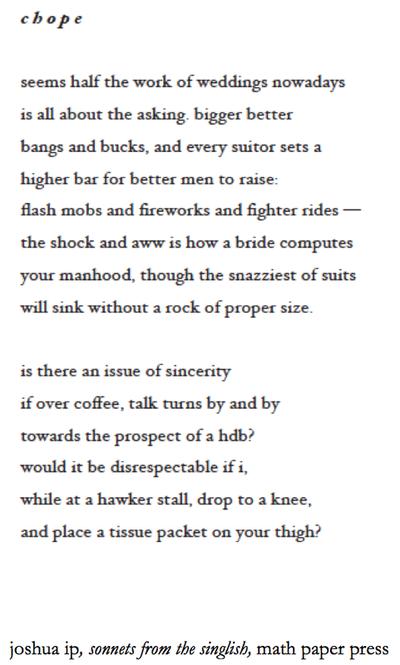 the poems are all sonnets, an archaic italian fourteen-line rhyming verse form that went out of fashion about the same time as frilly pants. 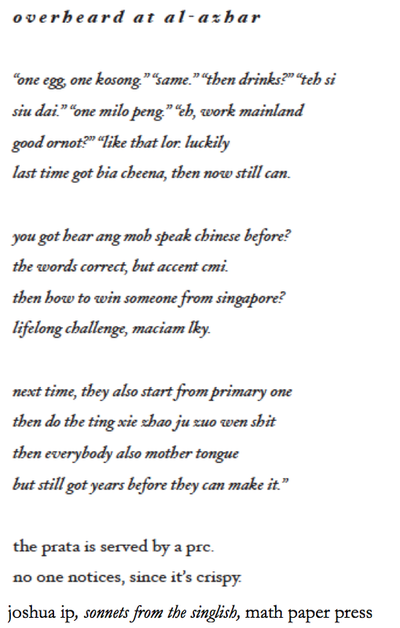 it was first published by Math Paper Press in Jun 2012, and (co-)won the Singapore Literature Prize for English Poetry. 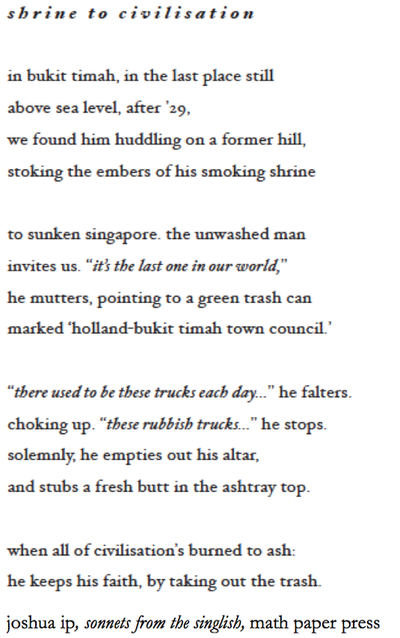 sonnets from the singlish UPSIZE EDITION doubles the original collection with 88 poems, and was released in Nov 2015. you can get it here. 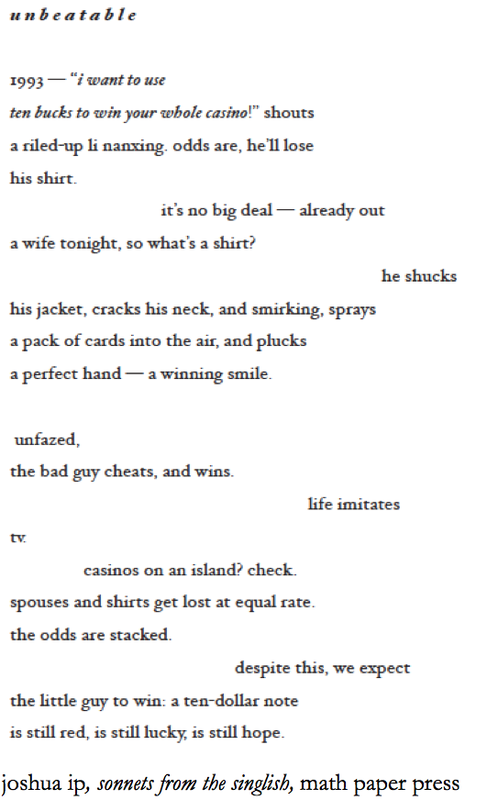 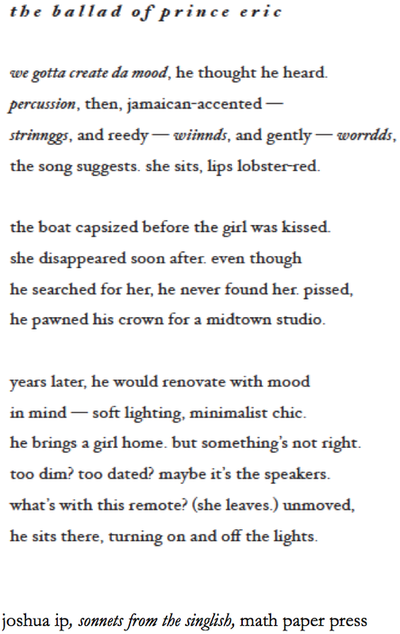 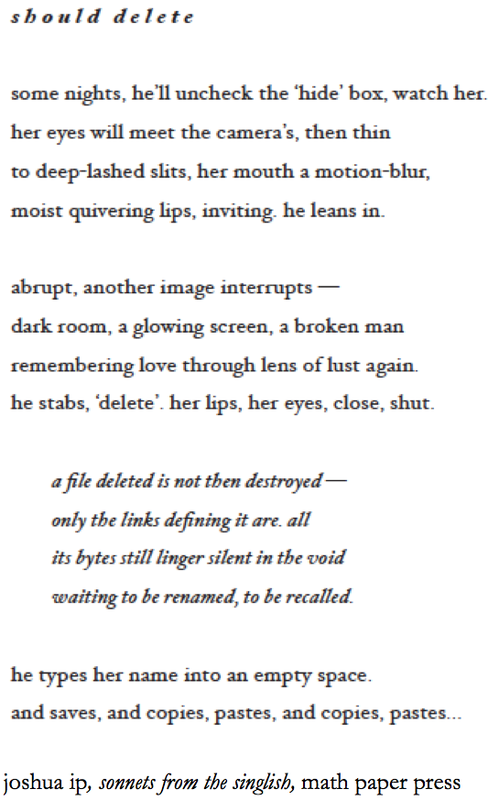 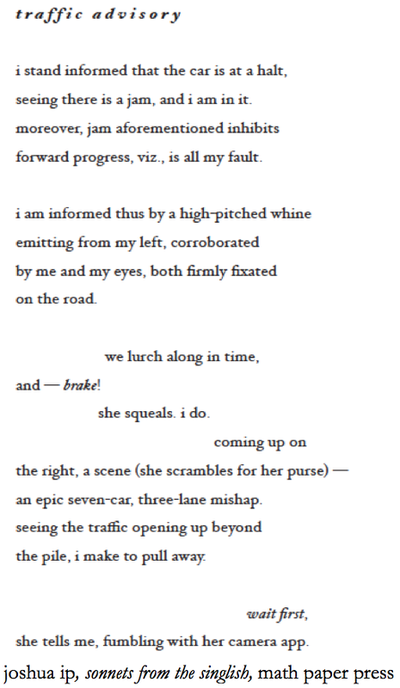 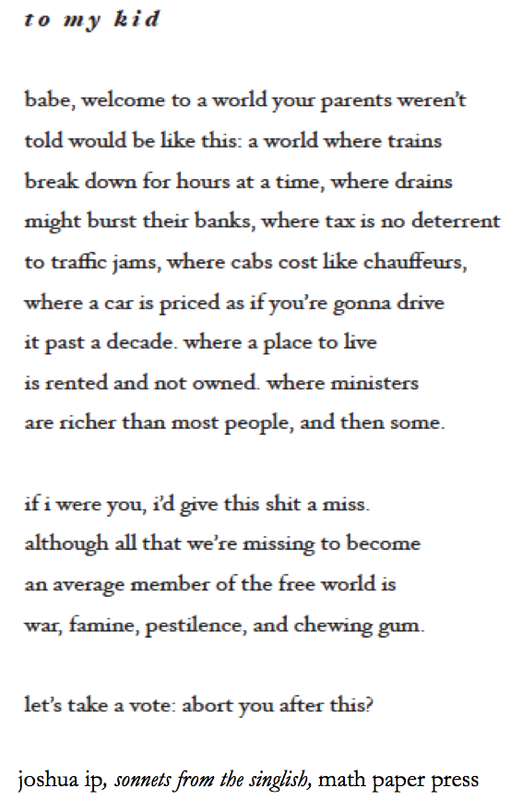 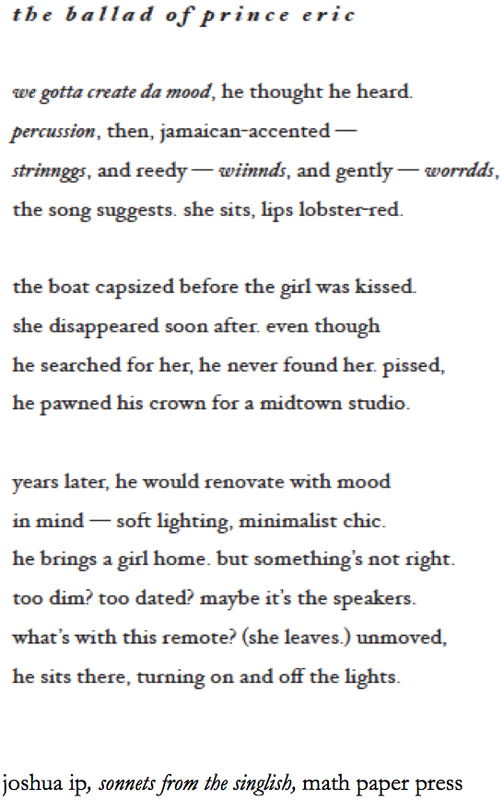 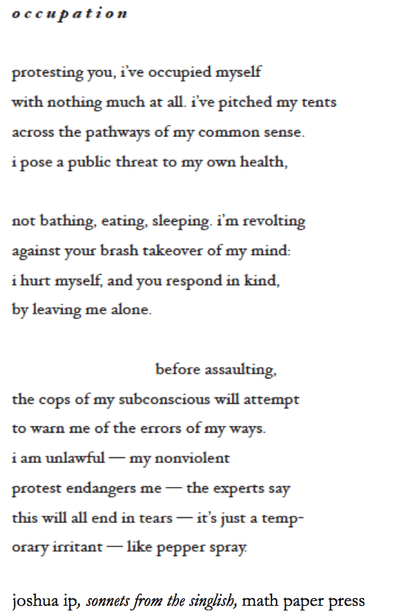 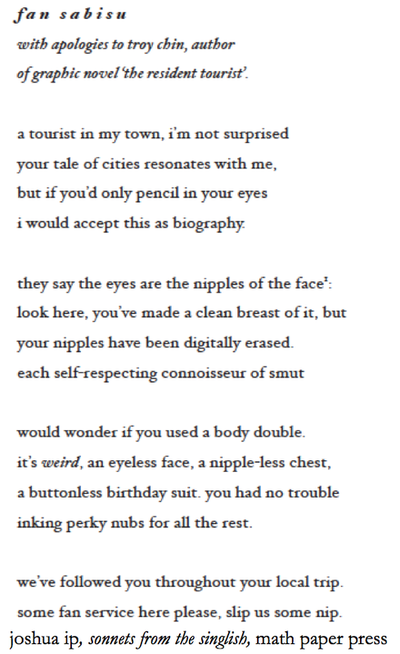 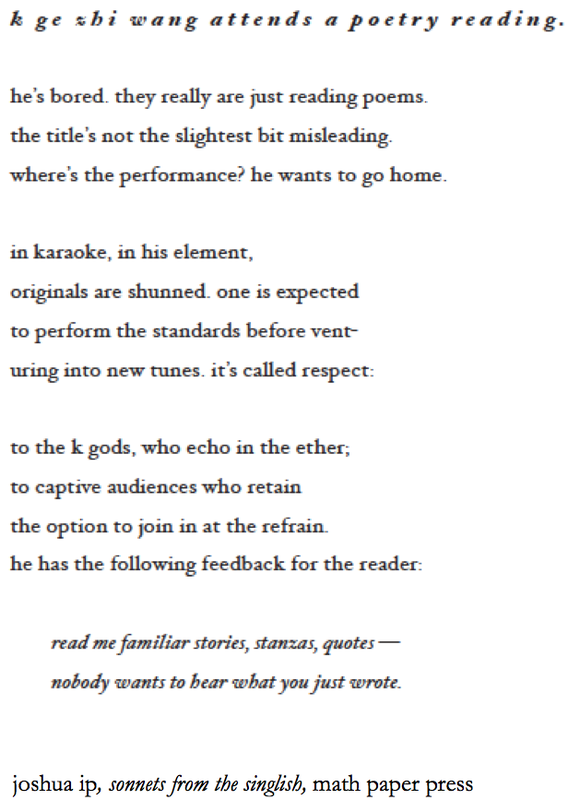 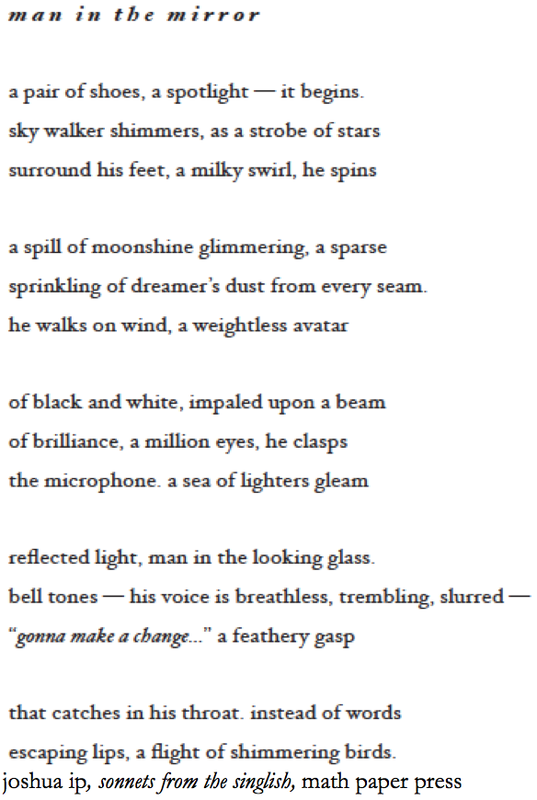 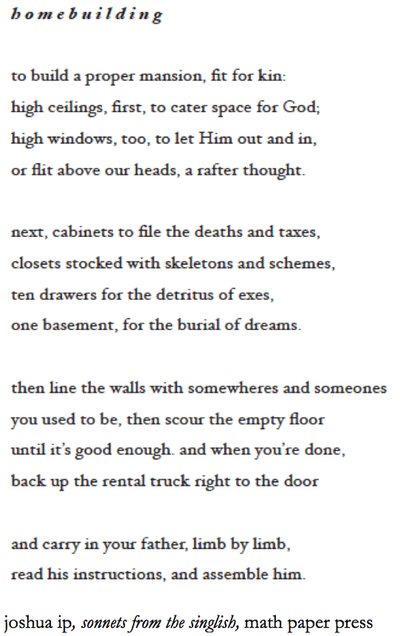 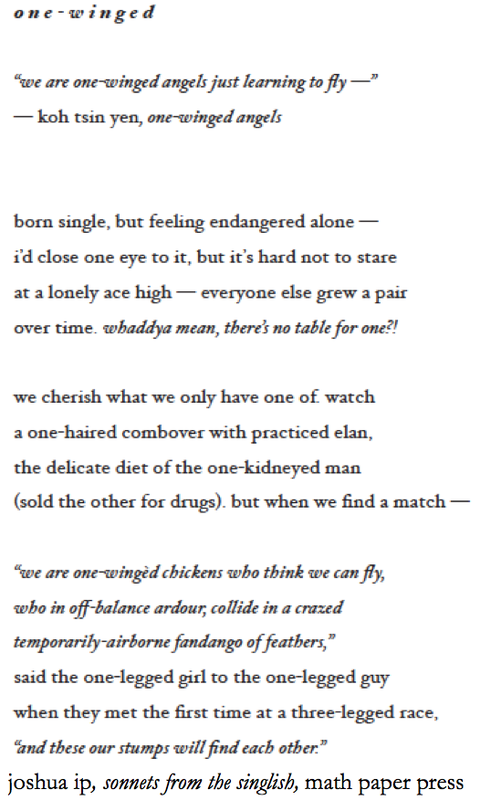 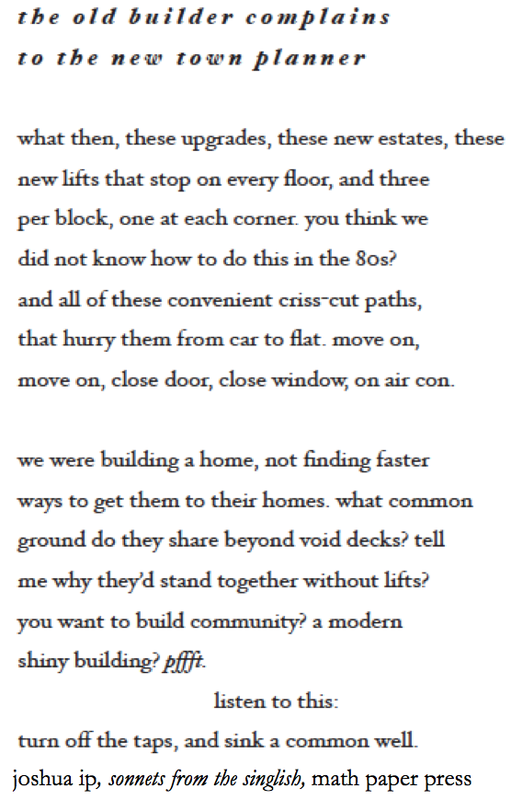 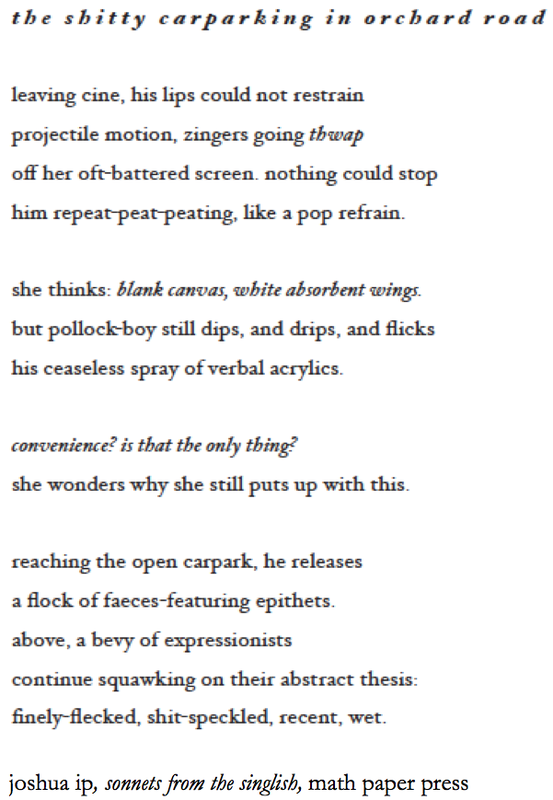 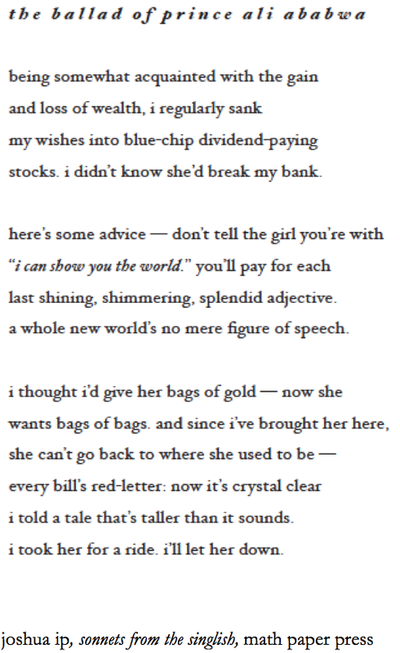 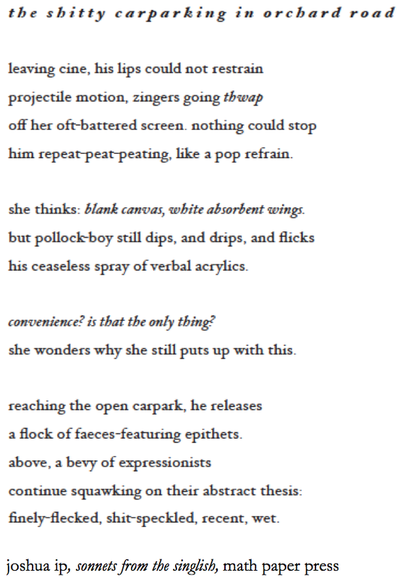 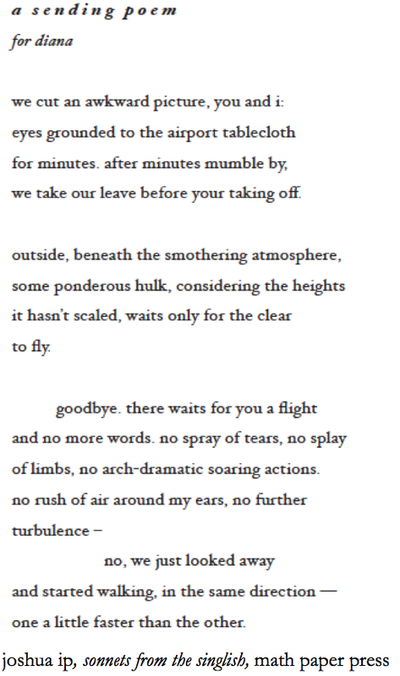 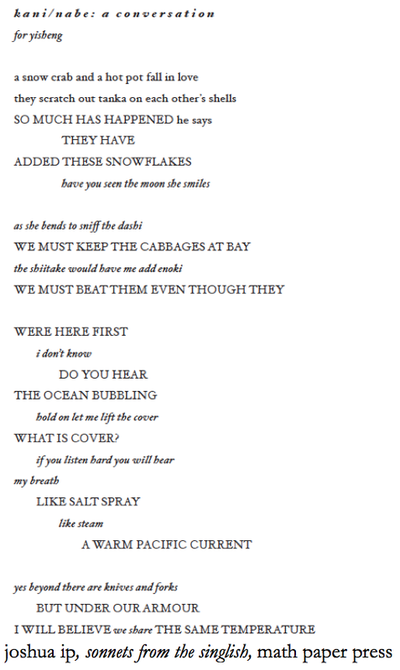 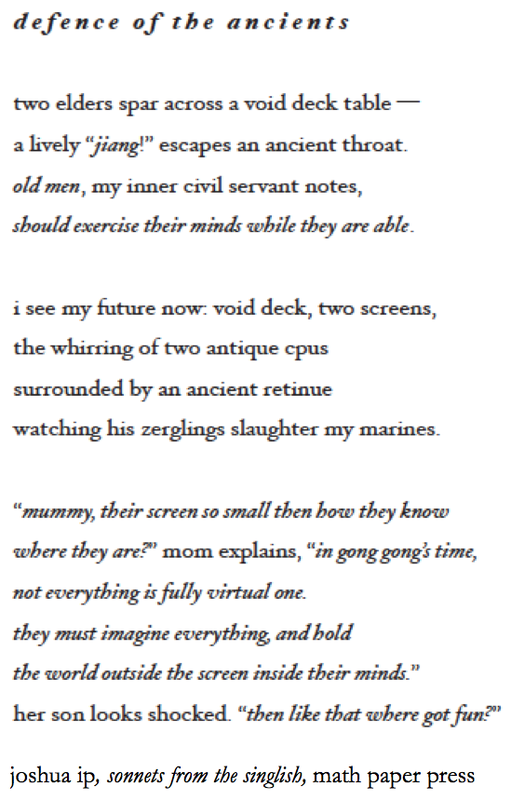 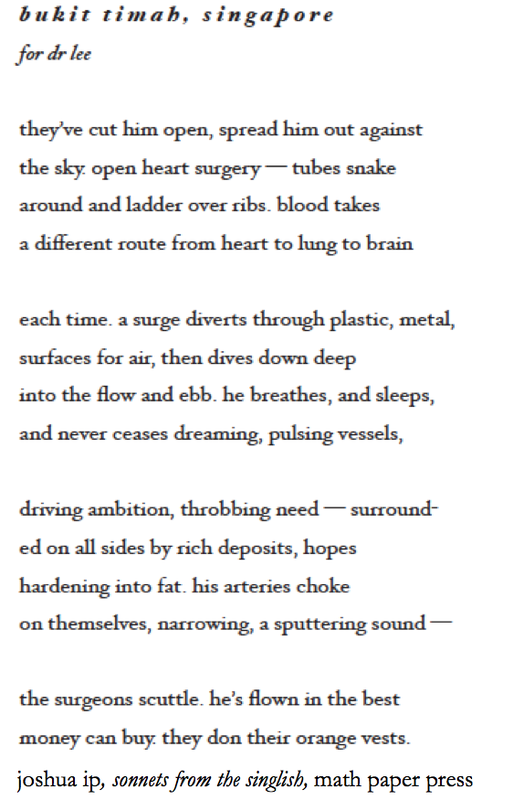 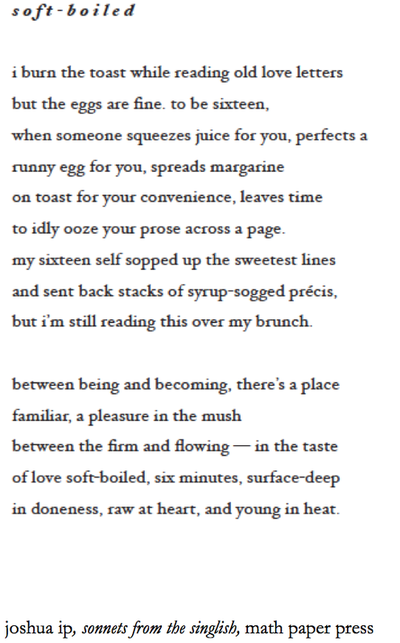 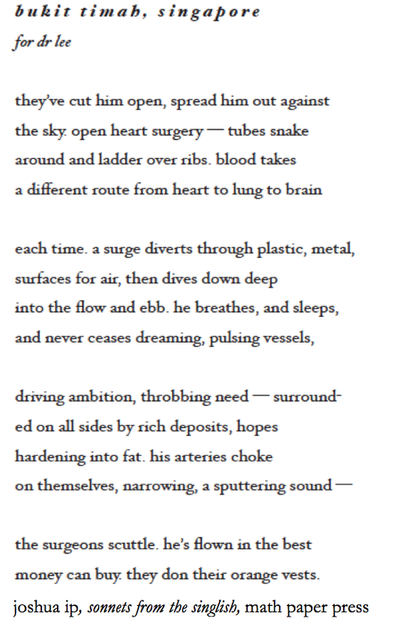 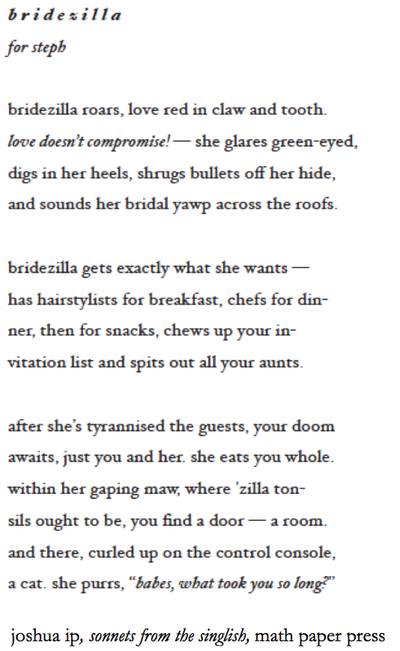 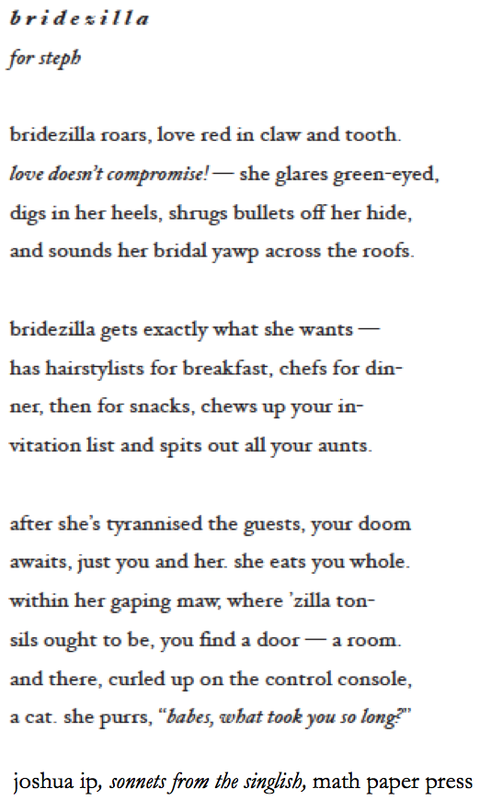 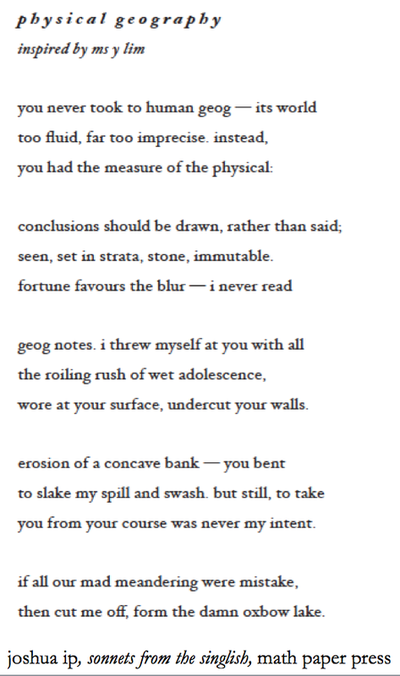 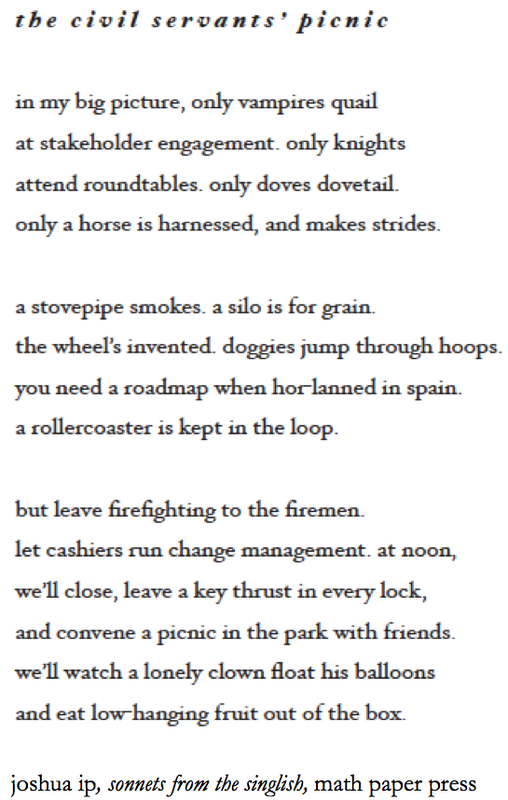 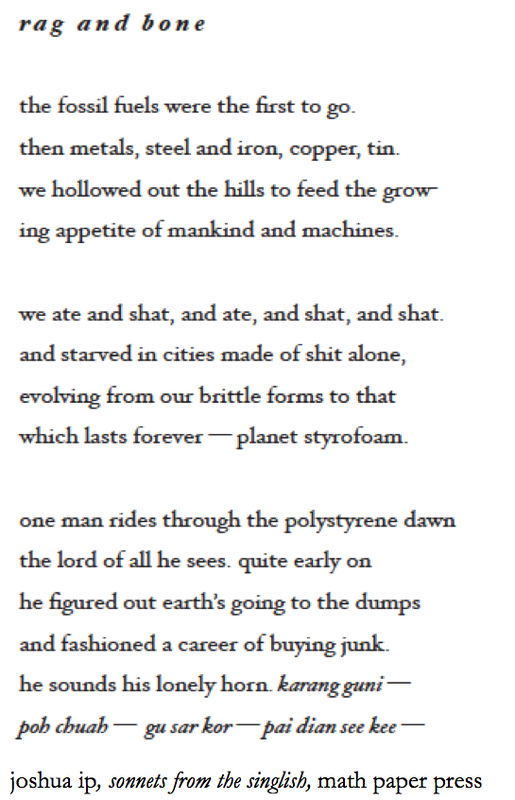 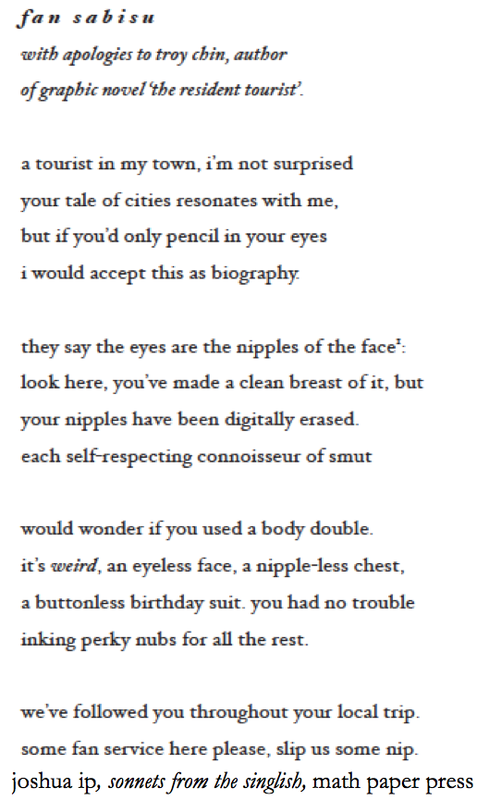 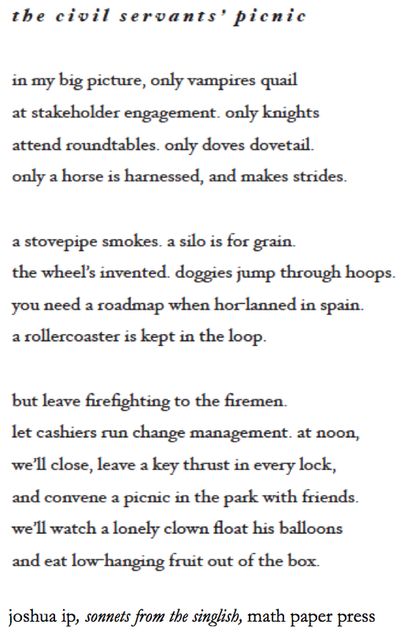 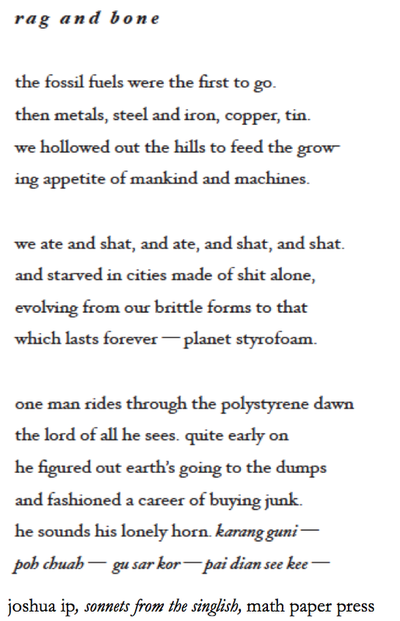 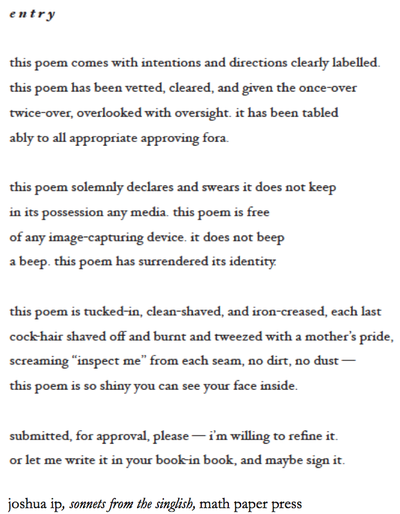 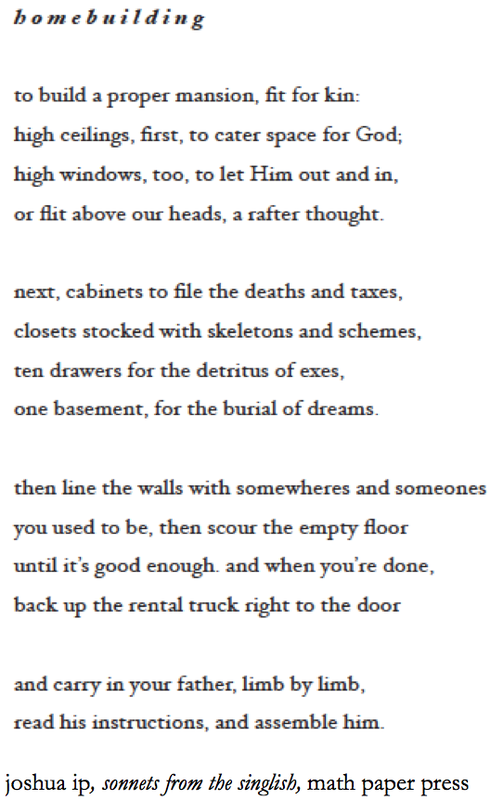 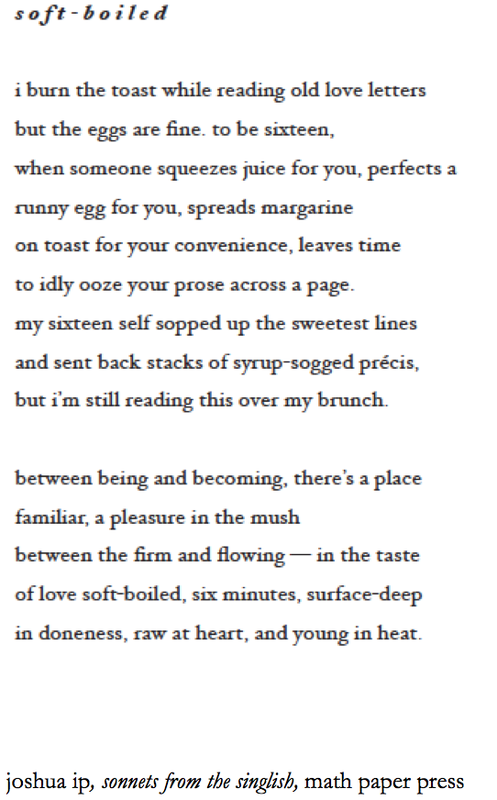 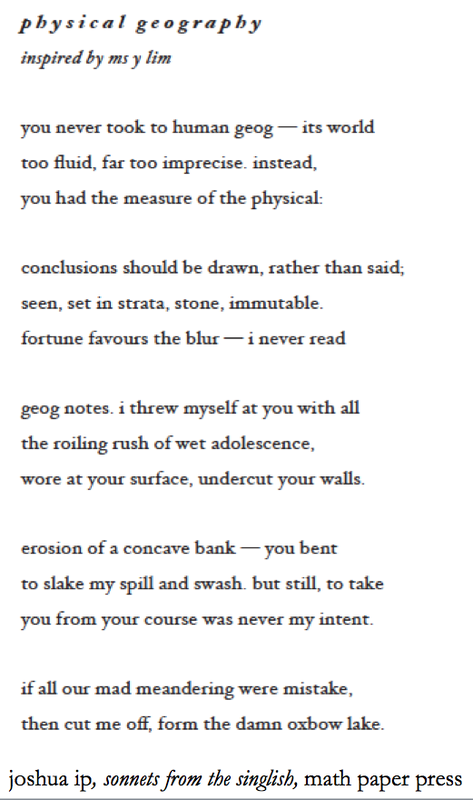 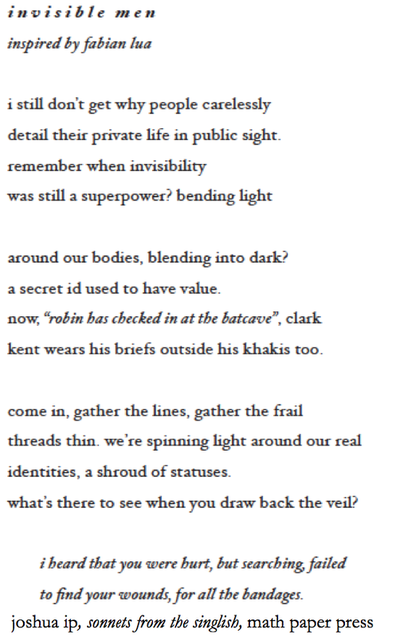 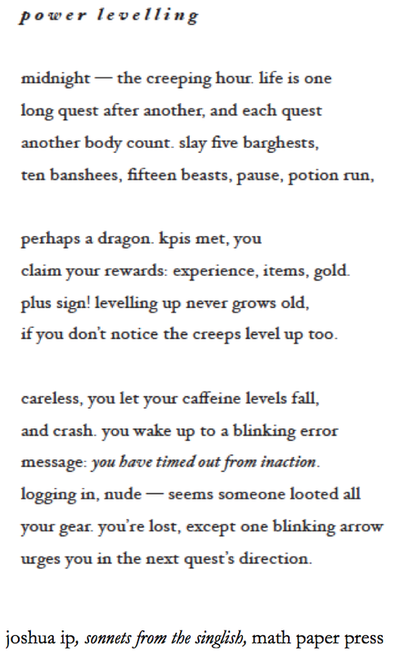 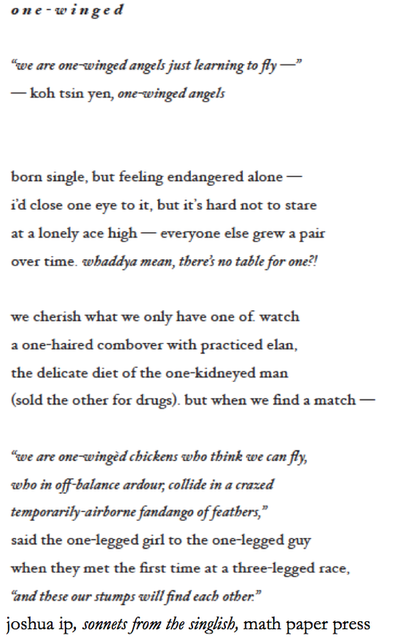 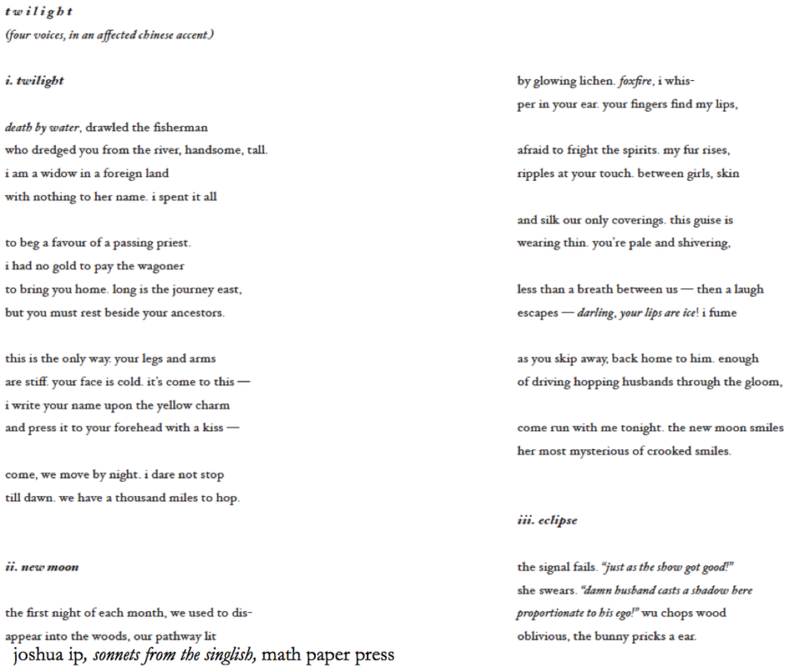 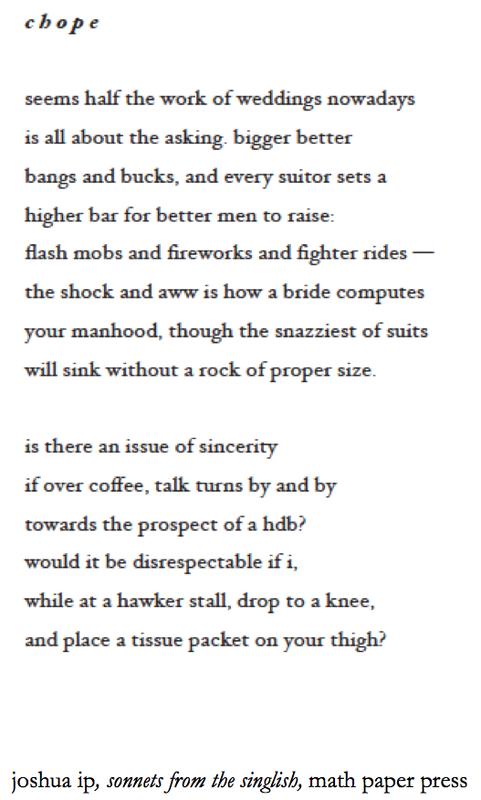 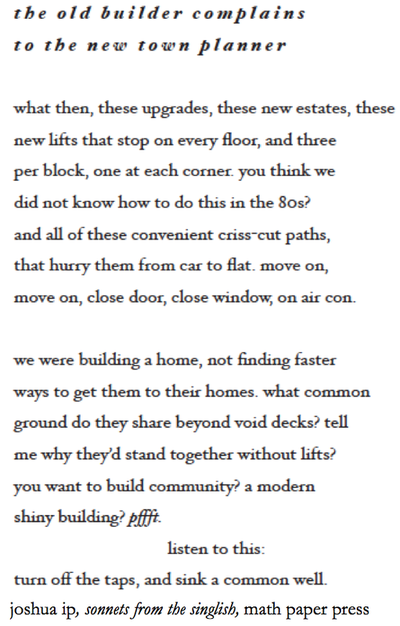 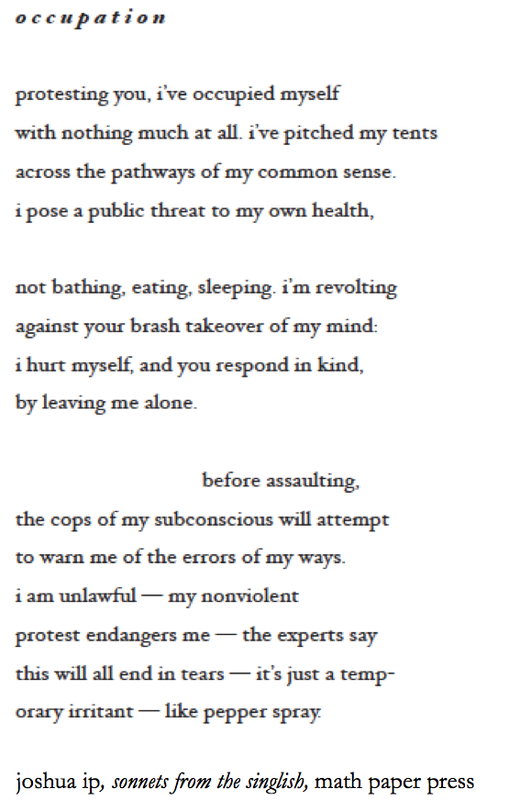 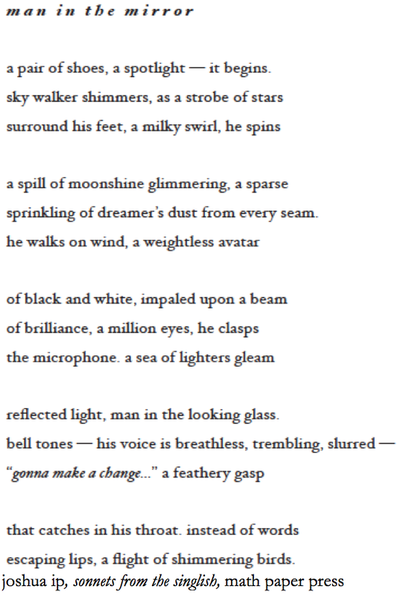 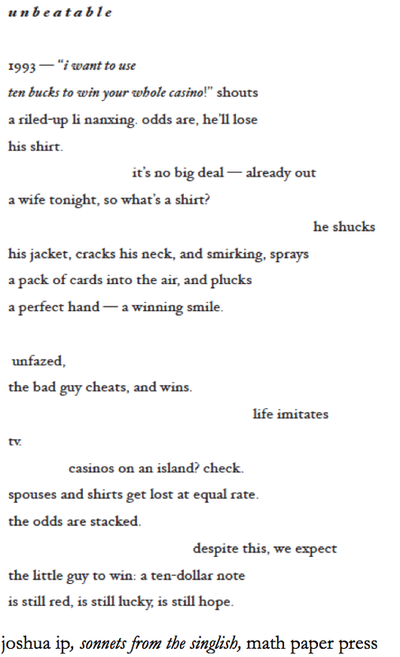 with the publication of the UPSIZE EDITION, i have released all of the 44 original poems (50% of the new book) in digital form below, as the original version is out of print (and wholly subsumed within the new version.) 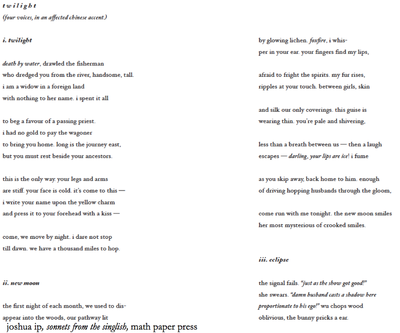 teachers, students, or just lovers of poetry may feel free to reproduce any of these images for your personal usage - enjoy! 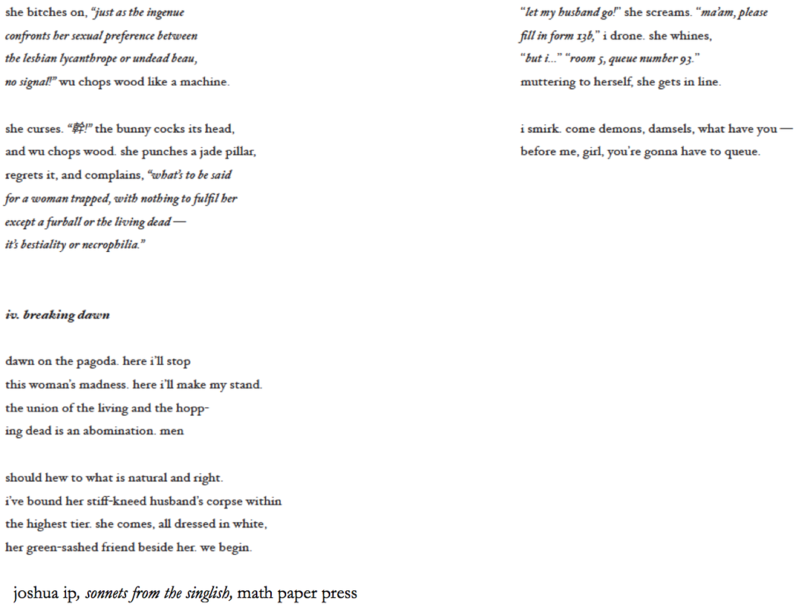 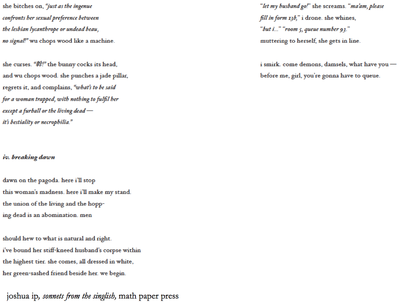 Note: from 2014-15 onwards, Math Paper Press has shifted from the serif font Hoefler Text to the sans serif font FF Kievit for its poetry publications, but i've kept the original font face to preserve the feel of the first and second editions. 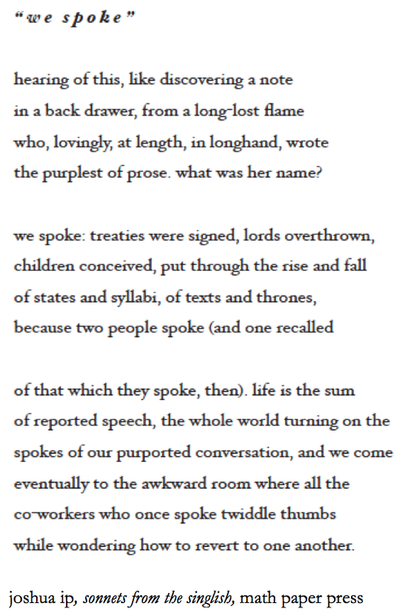 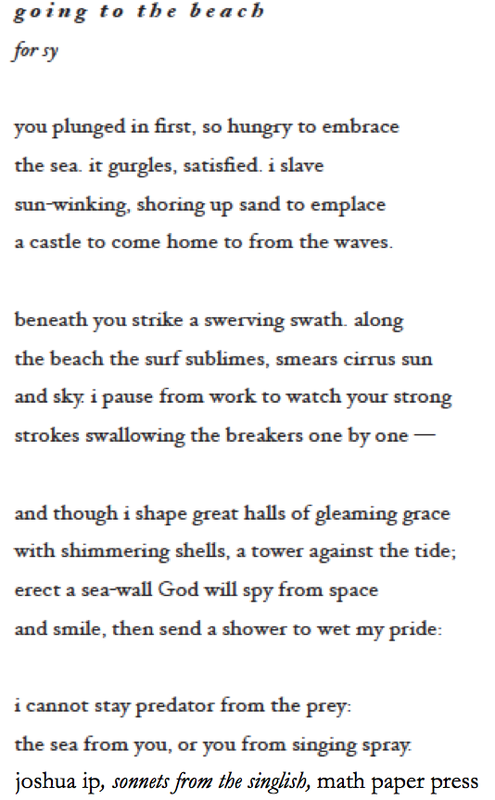 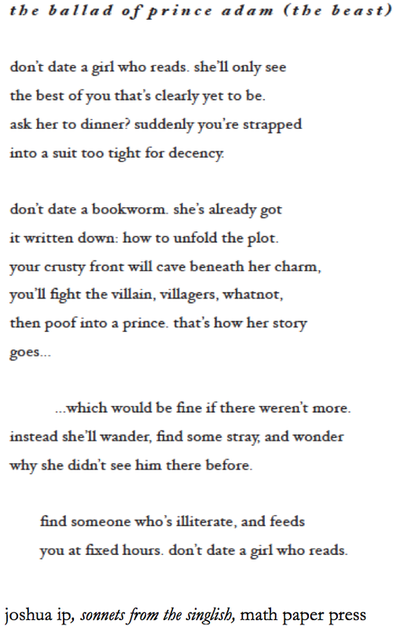 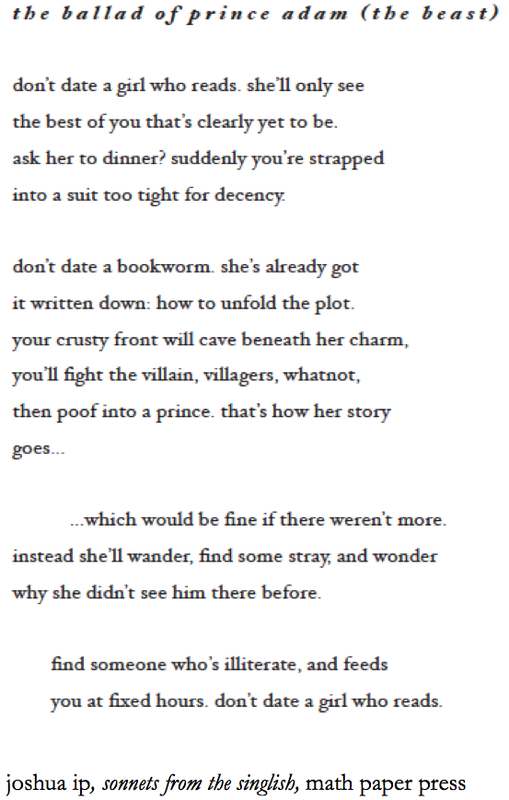 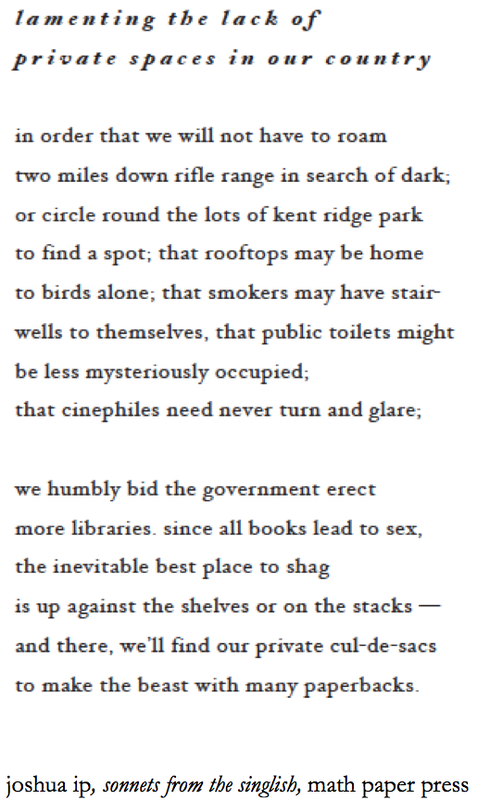 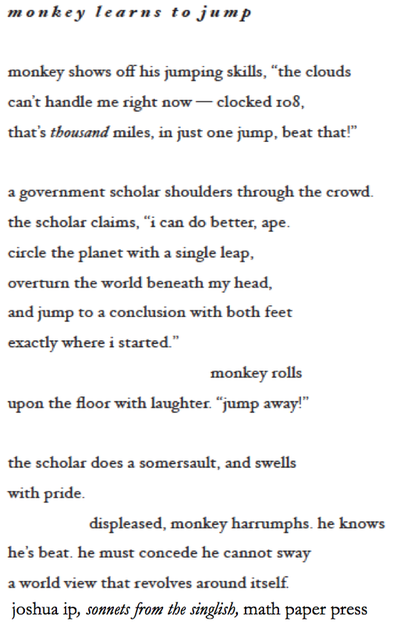 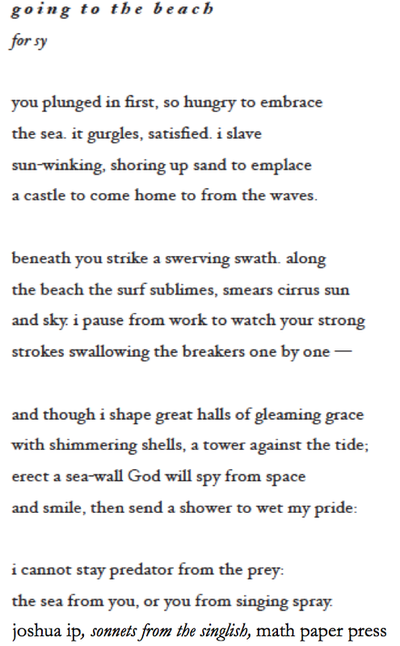 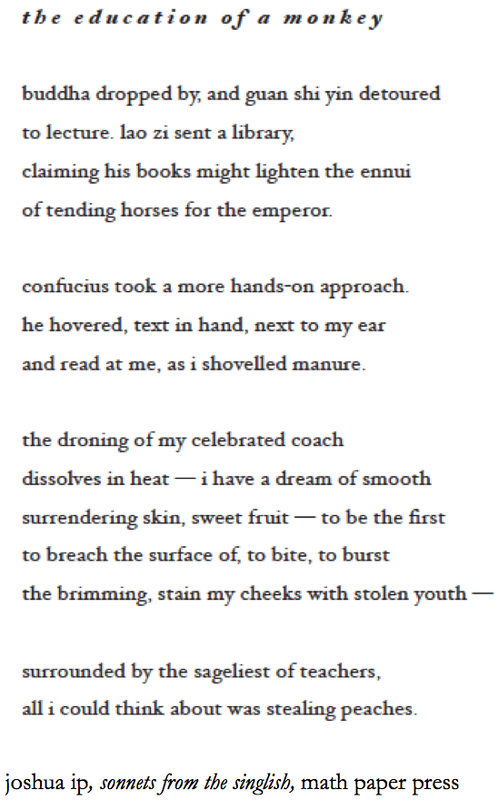 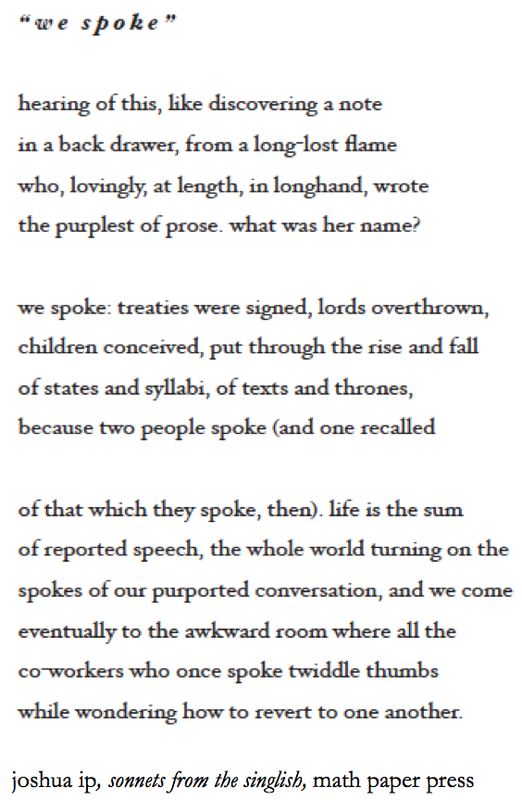 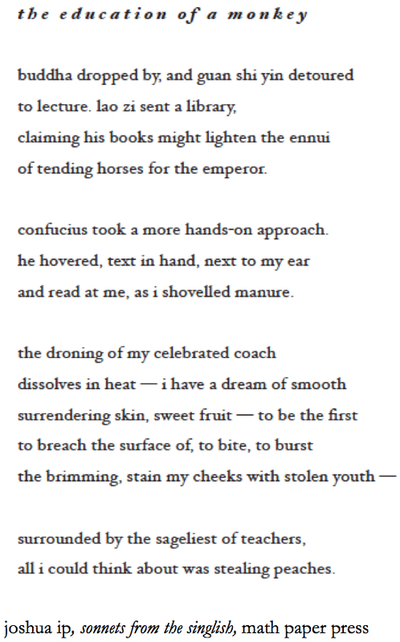 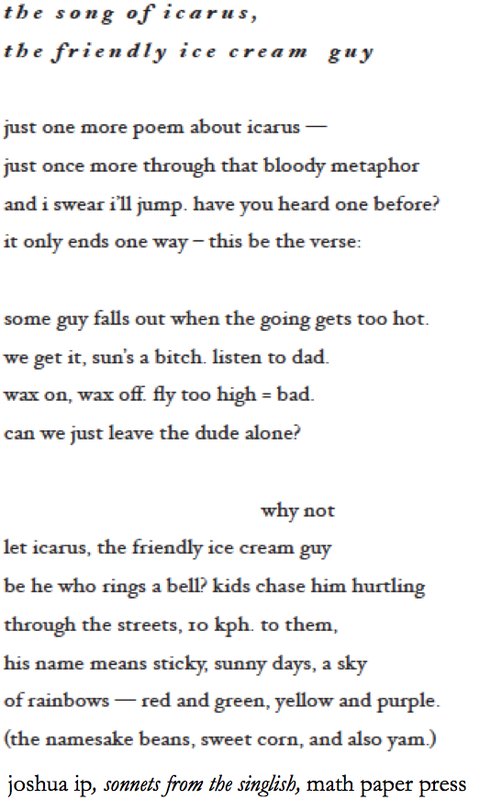 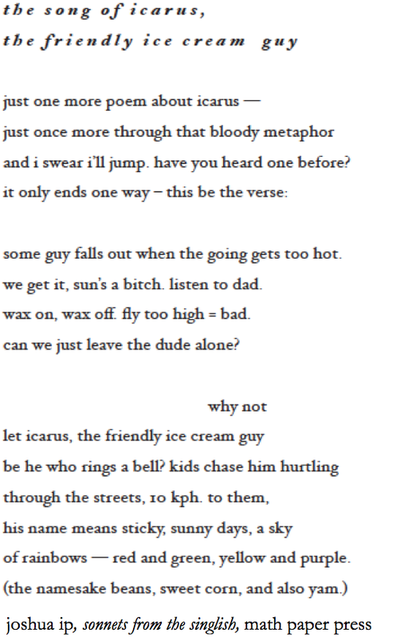 I am fond of the sonnet, and Joshua Ip plays with it to great satisfaction. 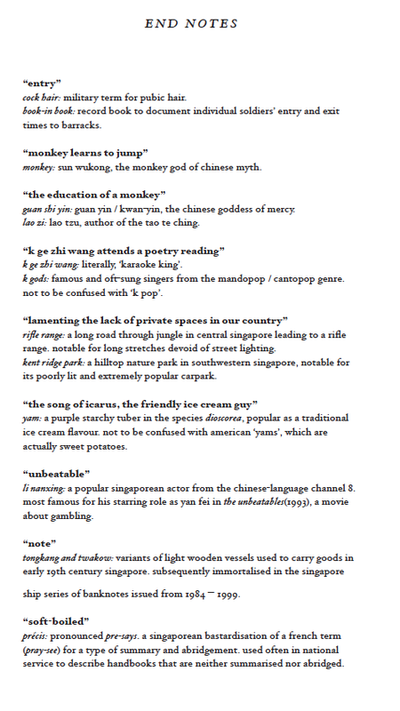 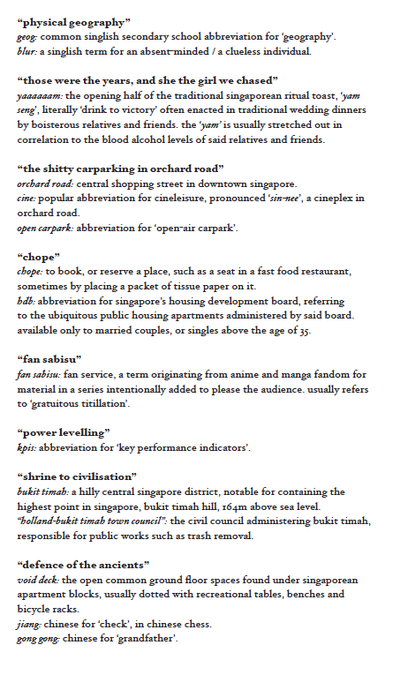 Occasionally there are lyric bursts of longing, perhaps even nostalgia, but these are balanced out with what I would call a clearheaded look at the state of the Singlish -- present language (language shapes thought) and how it relates to heritage. 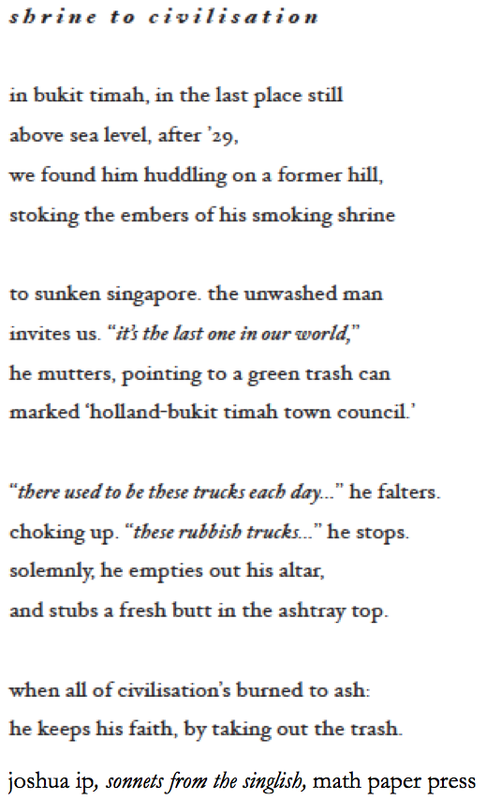 The ode to the karang guni man is a case in point: startlingly ecocritical, general and abstract, it narrows down to an unmistakably specific and concrete part of Singapore culture. 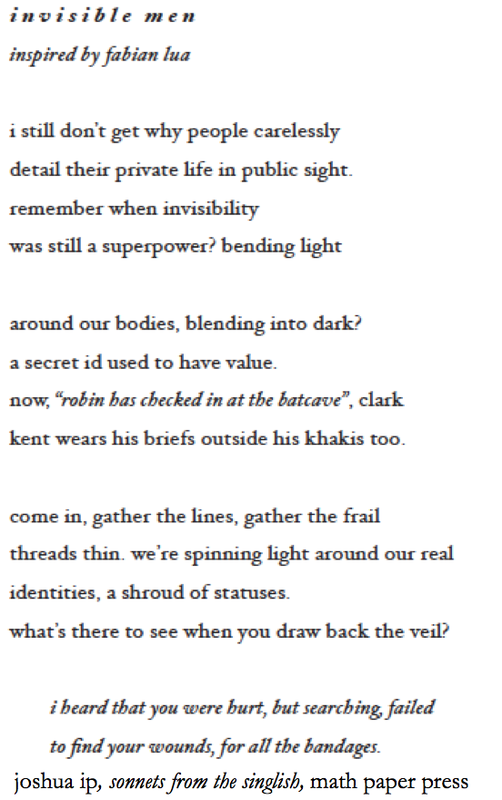 Possibly, then, these sonnets-as-identity do most of their work in the volta; in the change from past to present, from disparate traditions to something new. 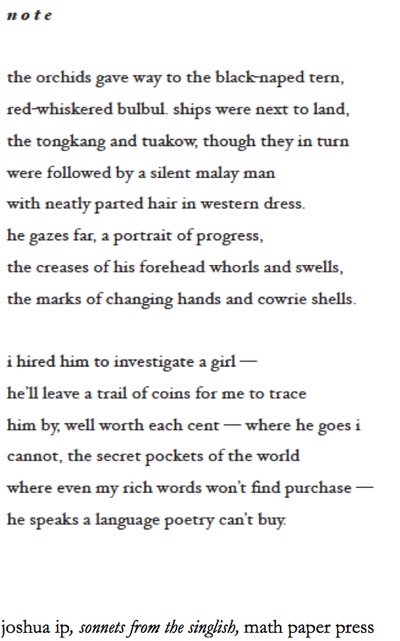 If these experimentations with cultural clashes from East-West, High-Low, Chinese-English, are anything to go by, Ip’s native tongue is the language of hybridity, and as he puts it in “tongues” (scrabble), he is indeed “learning a new way home” around the challenges of writing as an Anglophonic writer in the twenty-first century. 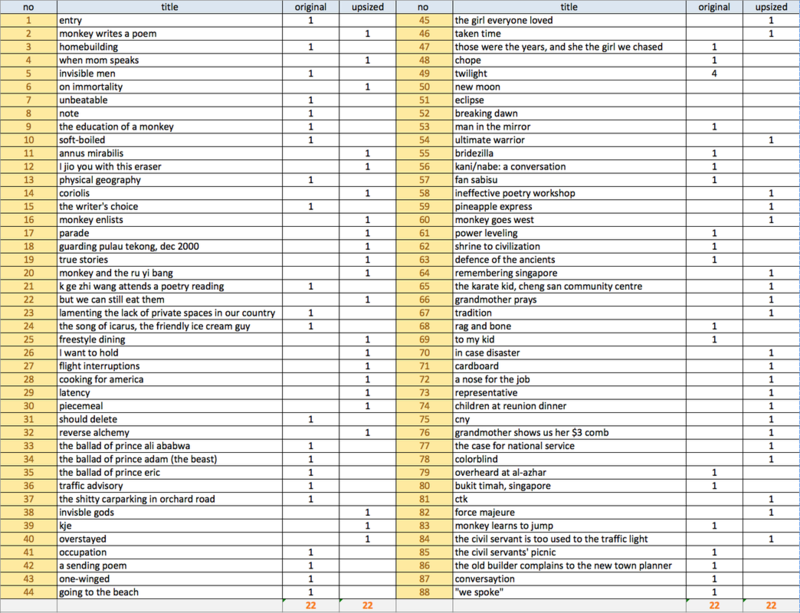 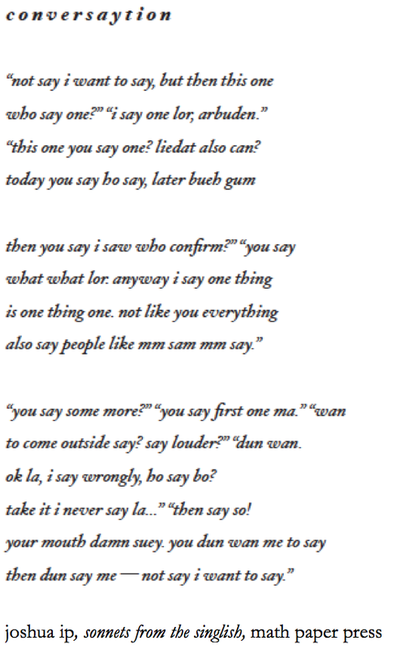 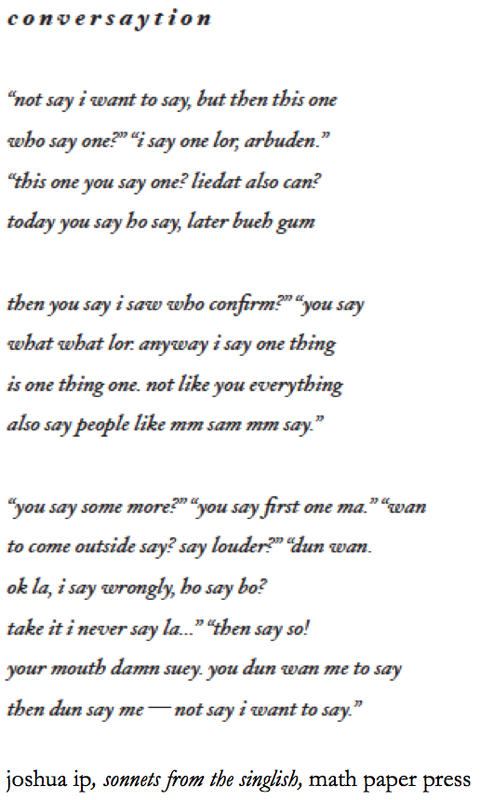 Don’t expect to read 44 poems written in Singlish, or 44 Singlish sonnets. 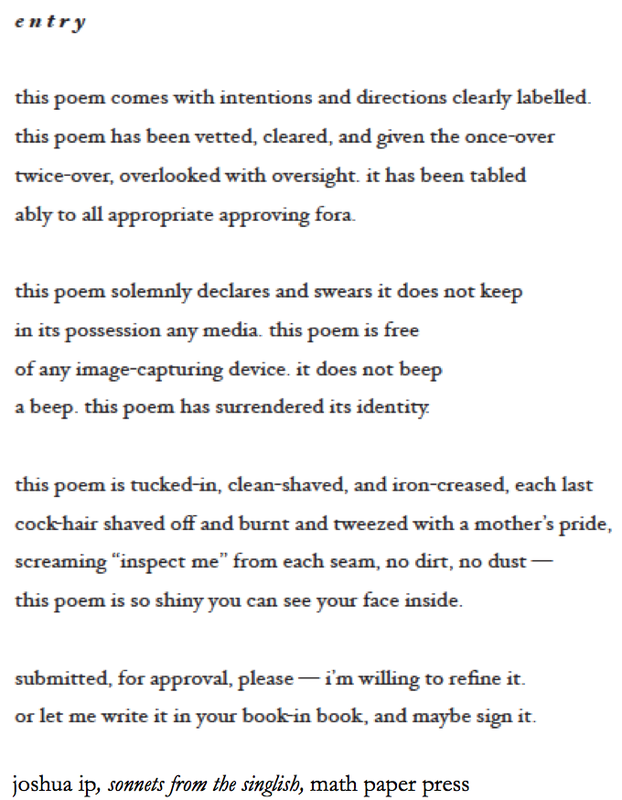 In fact, Ip has described the book as “riffing off Elizabeth Barrett Browning’s Sonnets from the Portuguese (also 44 sonnets).” But Ip does better. He mixes pop culture — mostly local, and some international with a local twist — while discussing local issues, and subtly expressing his opinions about local affairs; matters that are often uniquely Singaporean. Joshua Ip's Sonnets from the Singlish (first published in 2012) showcases a completely different kind of down-to-earth poetry, one that is rooted in the poet's consciousness of the nuances and mundanities of everyday life in Singapore... Its fluid and brisk rhythm, permitted by the iambic pentameter of the sonnet form, imitates the candour of everyday Singaporean conversations... 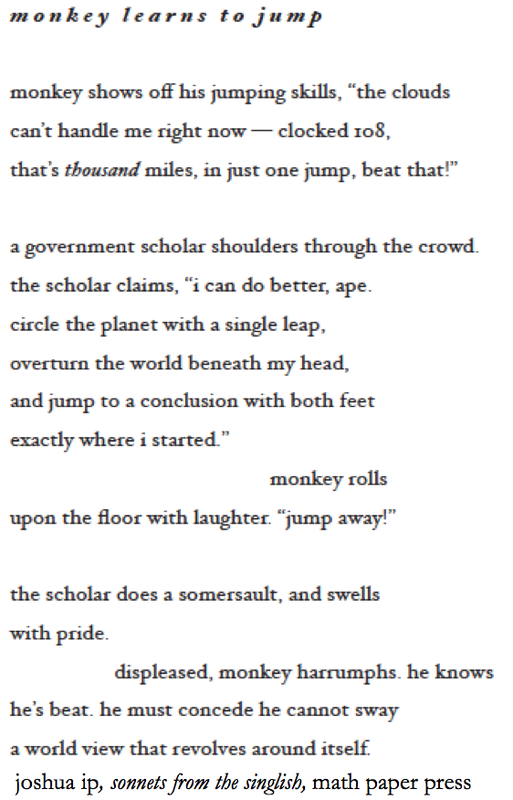 They trivialise as a way to strive and survive. 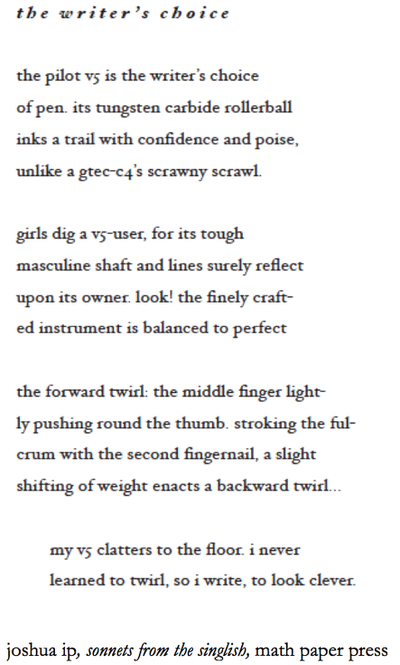 As with the first 44, the new sonnets are breezy, digestible renditions of the traditional form (famously used by Shakespeare). 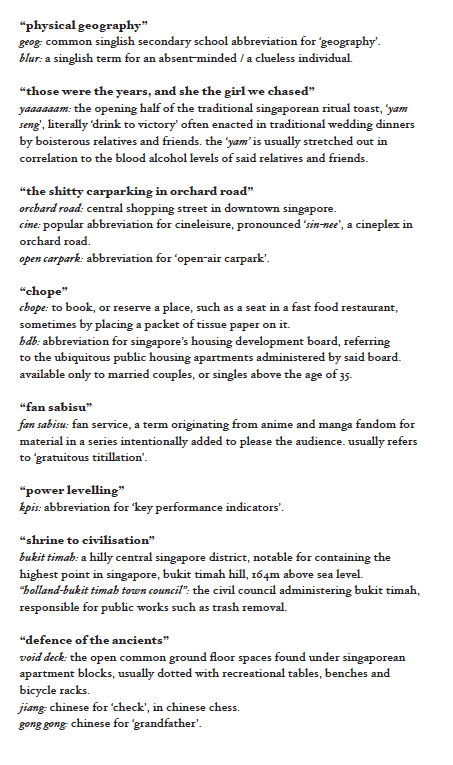 Literary snobs may turn their noses up at some of Ip's earthier references, which include videogames (StarCraft and The Witcher), Jack Neo films ("us motley ah-boys grew to men"), and even Miley Cyrus ("i came in like a wrecking ball")... His relatable references are part of the appeal. 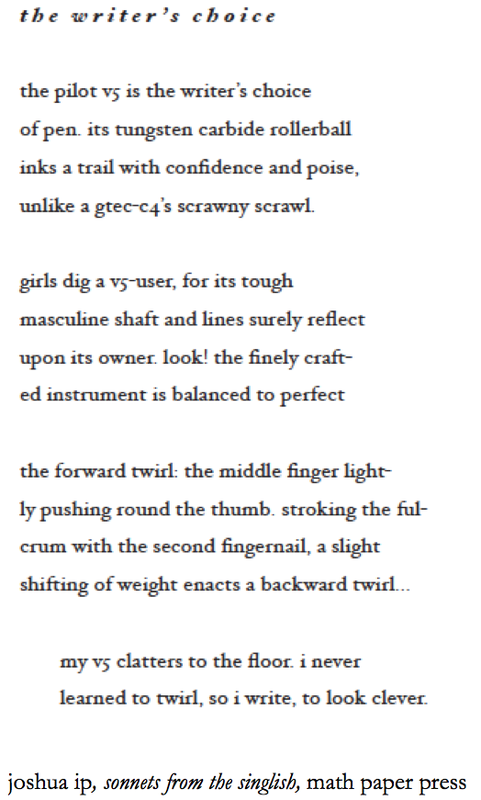 But dig a little deeper and the profundity comes through... ...Ip's greatest strength lies in crafting these absurd scenarios, which vividly and concisely capture the gist of his philosophising. 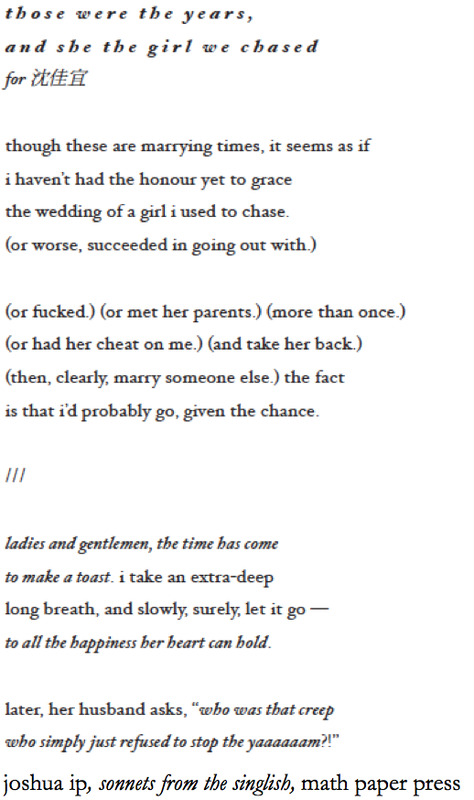 those were the years, and she the girl we chased. 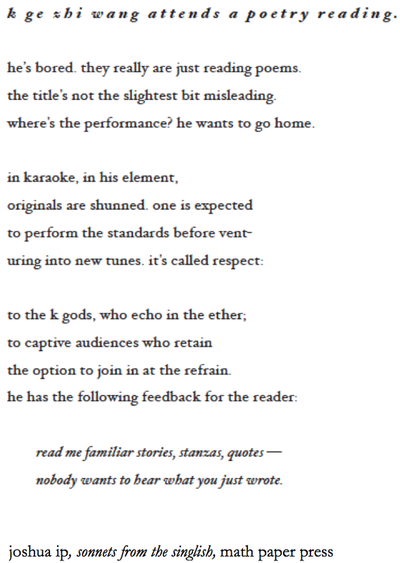 and because some people like them, the end notes.